The Internet raises significant challenges for public policy and sustainable human development, both internationally and for individual nations. Hence, the ongoing development of international policies and procedures to govern the use and operation of the Internet. However, although the Asia-Pacific region has the biggest share of global Internet users, it is under-represented in forums that develop Internet-related policies. There are a number of issues and specific challenges related to Internet Governance in the regional context. Governments of emerging economies need to understand these issues if they are to have a voice in the global information network. 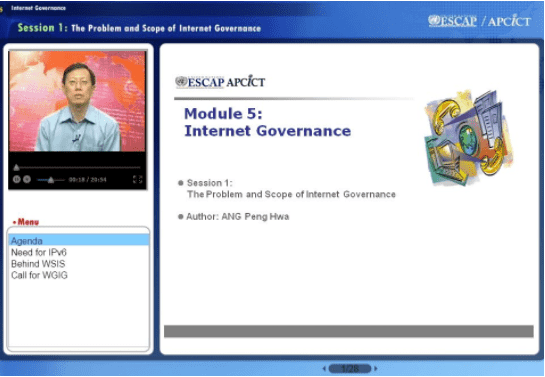 Outline the first steps towards better governance of the Internet in their respective countries. Ang Peng Hwa is Professor and Director of the Singapore Internet Research Centre at the Wee Kim Wee School of Communication and Information, Nanyang Technological University, Singapore. Also a lawyer by training, he teaches media law and policy. His research is in the area of Internet Governance. His 2005 book, Ordering Chaos: Regulating the Internet, argues that the Internet can be, is being and should be regulated. In 2004, he was appointed by the UN Secretary-General to the Working Group on Internet Governance to prepare the report for the 2005 meeting of the World Summit on the Information Society. He later helped co-found the Global Internet Governance Academic Network where he served as inaugural chair. He currently serves as chairman of the Asian Media Information and Communication Centre. He also sits on the Governing Council of the Mudra Institute of Communications, Ahmedabad, India. He is on sabbatical as Dean from July 2008 for one academic year to head and help start the Mudra Institute of Communication Research.